This has been bothering me ever since I started flying again. My non-flying friends think my hobby is "geeky". Let me start off by saying I am a geek & proud of it. I love anything technical, spend hours watching engineering/science related TV shows not to mention scifi. I don't buy computers I build them & yes, I play a Gnome in World of Warcraft. But when I'm at the flying field & look around at my club mates I see all sorts of people from all manner of backgrounds. Other than a common love of flying I can't really say they fit into any particular stereo type. Sure a few like me could be aptly described as geeks but for the most part they're regular people. So I guess my question here is, are my friends correct, are we geeks? The very few people I've met a the few fields have not gave me the impression of "geek" squad. I'm far from geeky, I have a computer radio, but I dont know how to program half the crap in it. None of my warbirds are on dual rates, none on expo, and nothing is coupled. All my warbirds fly the way they do because the xmitter sticks tell themto. I luv endpoint adjust and servo reverse, I have no use for anything else, yes, I'm old school. I have no cell phone, cell pad, nookie nook or what ever they call that ebook, Xbox, WII, or any of that crap, oh, I do have basic cable and a DVD player, but mostly a library full of VHs tapes, mosly WWII aircraft but quite a few movies. Its a wonder I have a computer, although my knowledge is very limited to surfing and emailing the net.I spend most of my free time in the workshop and at the field. Nowadays , the only electronic knowledge required is to know the + side of a battery from the - ...... The electronic geek factor having been totally removed from the hobby . No one I know still builds their own RC electronics .. BUT ! , , , to the average , non tech minded public , ANYTHING as techno as a remote controlled plane IS most certainly Geek , under the present day description of the word . Even with the electronic side of the hobby now being pre made , the technology of flight itself is way too much science for the average non tech minded observer . And thus they see it as Geeky . Don't forget , most of these people think we still build these planes out of balsa and tissue paper , and know nothing of the ARF nature of both the radio gear AND the planes that radio gear go in ! Funny , when I was young the term Geek meant more of what the term Freak means today , instead of being a proudly worn label of the folks who are computer gurus ..
Nope. The geeks are the guys designing the circuitboards and software in the transmitters. They make lots of $ doing it. We're the cool dudes flying the hot babe-magnet toy airplanes. ;-) We spend lots of $ doing it. Chics really dig rc flyers .. Isn't that the thing that always flashes 12:00 ? My wife says I'm an "airplane geek". She maintains it's a term of endearment but I'm not so sure. I conned her into posing with one of my "toy" airplanes for pictures which I now use to blackmail her. If she gets out of line I have threatened to post the pics on Facebook! Seemed like a good idea but I really don't think I scare her very much. Oh well, I still get to be married to her which is pretty darn nice even if she's not intimidated by her "airplane geek". I prefer the noun "anorak". He (it's always a "he") is an anorak. I associate the term "geek" with people of a very technical mindset ... which is rarely the case with model flyers, in my experience. "Anoraks" occupy a broader church. There is a subtle difference between the geek and the anorak. Geekiness implies a level of competence which is generally absent in the garden-variety "anorak"... though there have been reports of inter-species breeding, leading to some notably inept off-spring. Though increasingly rare, "Anoraks" can still be found on the wind-swept platforms of railway stations; notebooks in hand. In fine weather, they may even be spotted clinging to the chain-link fencing of airports. Owing to habitat loss, their numbers are declining and it is unusual to find a healthy example in the wild. The proliferation of their natural predators ... police, security-cameras and busy-bodies ... means that the breed is now rarely seen outside of captivity. My wife says I'm an ''airplane geek''. She maintains it's a term of endearment but I'm not so sure. 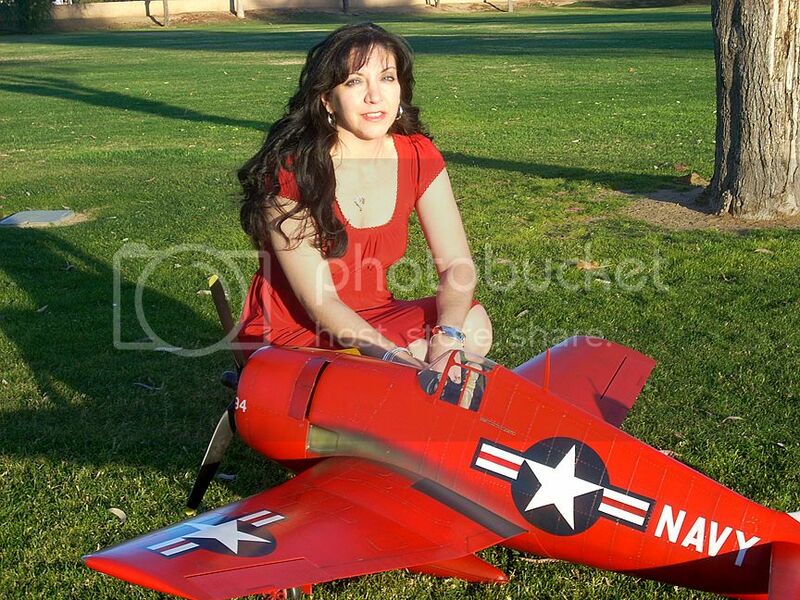 I conned her into posing with one of my ''toy'' airplanes for pictures which I now use to blackmail her. If she gets out of line I have threatened to post the pics on Facebook! Seemed like a good idea but I really don't think I scare her very much. Oh well, I still get to be married to her which is pretty darn nice even if she's not intimidated by her ''airplane geek''. I don't think we are all Geeks, I do find there are always the notable 'Club Expert Guys', every club has them, some have several, I know my club has several; these are the guys that know everything, first to let you know they know everything; interfere and interject into other peoples conversations; following you around elaborating on useless extraneous information; when you ask a simple question, they answer the question down to the molecular level; when you talk about something you are using or doing, they of course use something better or have done that better; they show up at the field in their vehicle that can double as a mobile Hobby Shop; sound familiar, then you probably have a Club Expert Guy in your club! Like many hobbies and activities, there are Geeks in it which then give the perception of it being geeky. I've seen some hosting events at my club that make me want to go hide with how serious they take it. People who take this stuff way to serious definately fit into this bucket. People who go around trying to report people for percieved rule violations, memorizing AMA codes etc are Geeks. People who try to justify buying some expensive Heli for a practical use are also geeks IMO. People who want attention from others by showing off their parkzone mustang or whatever and act like its the same as the real thing are geeks. I feel we can all have fun, still have girlfriends, still be safe, Go to the gym, and fly/Drive RC without being geeks! Notghing wrong with the above but just getting geeky IMO. The same concept exists in car shows, where a geek may show up with a 2012 dodge charger bought off the shelf to display amongst the home restored classics. Or one thing I noticed, we get invited out to a raceway to fly our jets on a perfect runway, and the geeks show up with 450 sized helis as if that is the purpose. That one ticked me off be because I dont need that crap flying around while I fly my jet. I do have a heli and love it though! PS I am an RC geek because I fit in the another non mentioned bucket, I obsess over it and build custom electronics for my stuff. This is geeky for sure but in a different way. I have always been a techno geek. I honestly don't think flying RC is anywhere close to being as nerdy as amateur radio and I do both so I guess could call me a geek. I got my ham license when I was 15 and thought about building an RC transmitter and receiver using peanut tubes from scrapped out hearing aids and military surplus junk. Everything was on 53 MHZ (Mc to all us old pharts) back then. The only problem was that I couldn't afford to build a plane, it was just too expensive for a fifteen year old kid. I was able to afford .049 control line stuff and that was what I did for a few years until I lost interest. I re kindled my interest again in 1980 when model planes and proportional controls became affordable for me. I lost interest again after I moved from Florida but got hooked again when electrics started getting good around 2002 and I'm still flying. The difference in the technology we have now compared to what was available when I was a kid is almost hard to believe. Back in the 1960's RC rudder and elevator control was all or nothing and planes had to be trimmed really well in order to fly. With all of the digital technology available today flying has never been easier or less expensive. You don't even have to build anything anymore, just buy a plane and radio and fly it. Are we geeks, yeah kind of. I own a LHS so I have to be a GEEK. I have to explain to new people how and why things work. At the field I never offer advice unless asked, then I try and keep it short and to he point. When I fly I'm off the clock and just want to fly. This has been bothering me ever since I started flying again. My non-flying friends think my hobby is ''geeky''. Original poster here. Wow lots of interesting & varied viewpoints. I guess what I've learned from this is you don't have to be a geek to participate in this hobby although it probably helps if you are at least somewhat technically apt. For example many members of my club are tradesmen, skilled workers, mechanics etc. They don't fit the traditional geek stereo-type yet are very technically minded & great at working with their hands. Others on the other-hand have issues changing a light bulb. Let me modify my original question... So even if we don't have to be geeks to fly RC, does doing so labelus as geeks? What is it about the hobby that makes some non-flyers perceive it as geeky? I run Linux, am CompTIA certified and ride a trials bike. I could go on but that should cover it. and enjoy it for sure. What is it about the hobby that makes some non-flyers perceive it as geeky? Because we play with "toy" airplanes, plain and simple. Most folks have zero concept of what is involved with the hobby nor the necessary skill sets needed to master its various disciplines. The word geek is a slang term for odd or non-mainstream people, with different connotations ranging from "a computer expert or enthusiast" to "a person heavily interested in a hobby"
This is part of a longer explaination/definition of the word geek according to Wikipedia..............wear it proudly. This hobby covers a pretty big spectrum. There are general hobbyist who build and fly for the fun of it who I would not classify as geek. Then there are those who are in the geekosphere who will design and draft their own plane, build it using the latest in composite materials, write their own computer code to control it with on-board video, gps, and telemetry data recording, and then design and build their own power management system and motors. To top it all off they will have a HAM license, turbine endorsement, and most likely will have a L2 high power rocketry certification.